My mom got a new desk over the Mother’s Day weekend. I stayed up until 4am that Sunday helping her put the desk and hutch together, and then got back up around 8am to help finish it up and secure it to the wall. The icing on the cake? I got her old l-shaped desk. It’s a cheap-o desk from Wal-Mart, and it’s definitely seen better days. 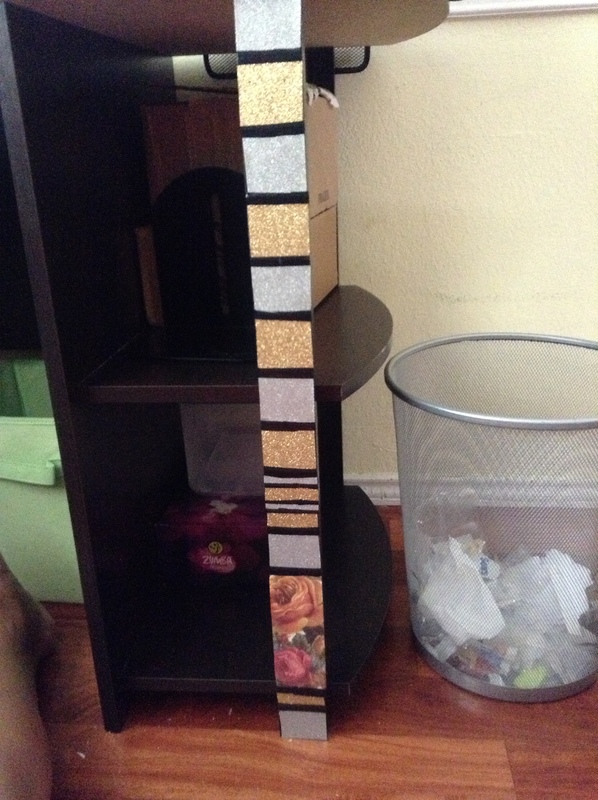 Like, before my nephew decided to pull off the “finish” like tape. It kept getting messed with and finally came all the way off one day. 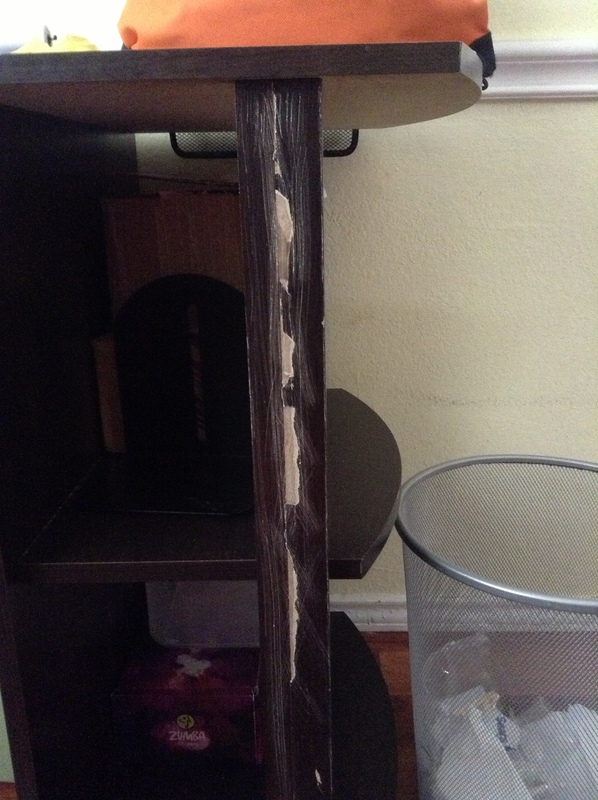 So now, I had this nice desk with a “slight” cosmetic defect. What to do, what to do? 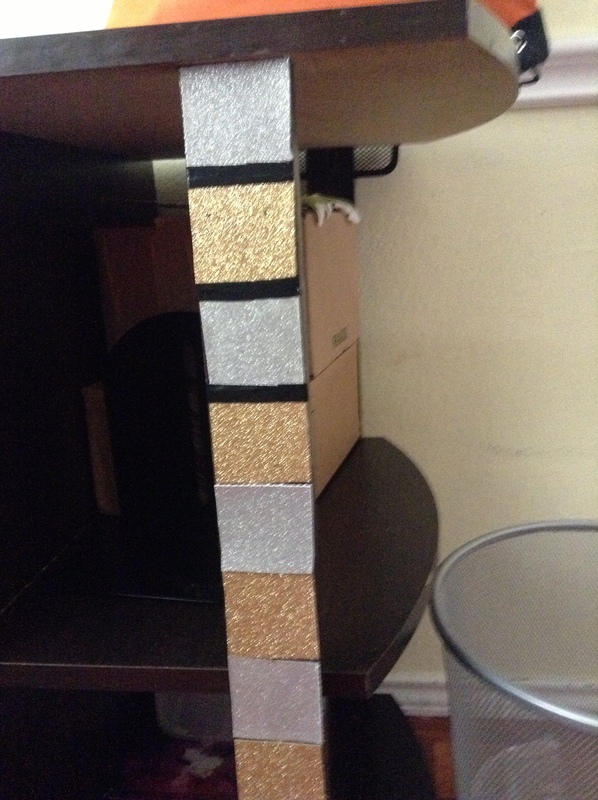 I started by making a square template for my glitter paper by cutting a small scrap of red cardstock to the width of the leg and squaring it up as best I could. I am going to need to cut a bunch of these squares, so a paper template was a no-no this time around. 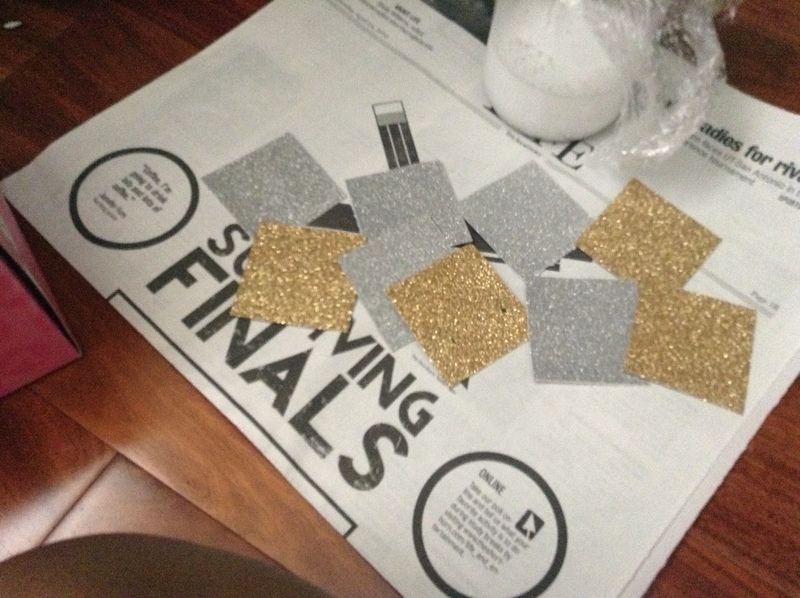 Then, I cut out the glitter paper squares. 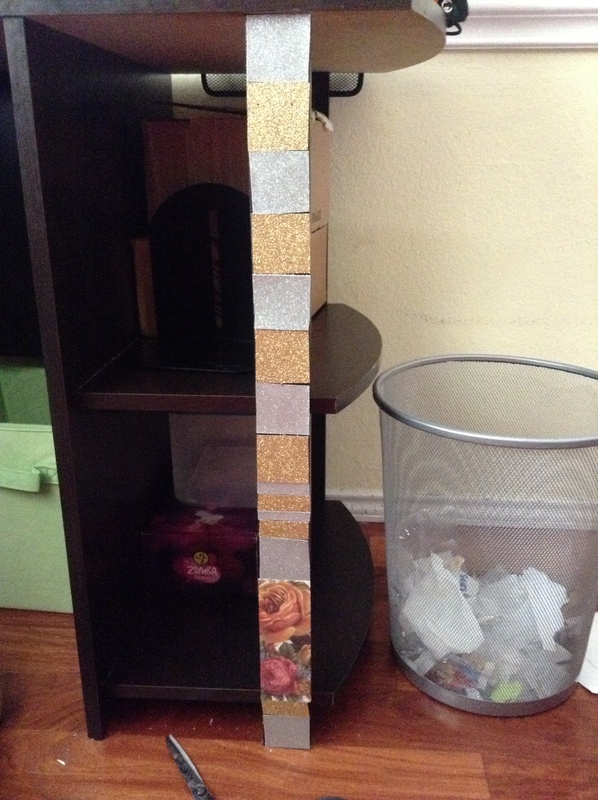 I am alternating gold and silver, but there wasn’t enough to do the entire leg, so I grabbed some tiny scraps and a small scrap of scrapbook paper. 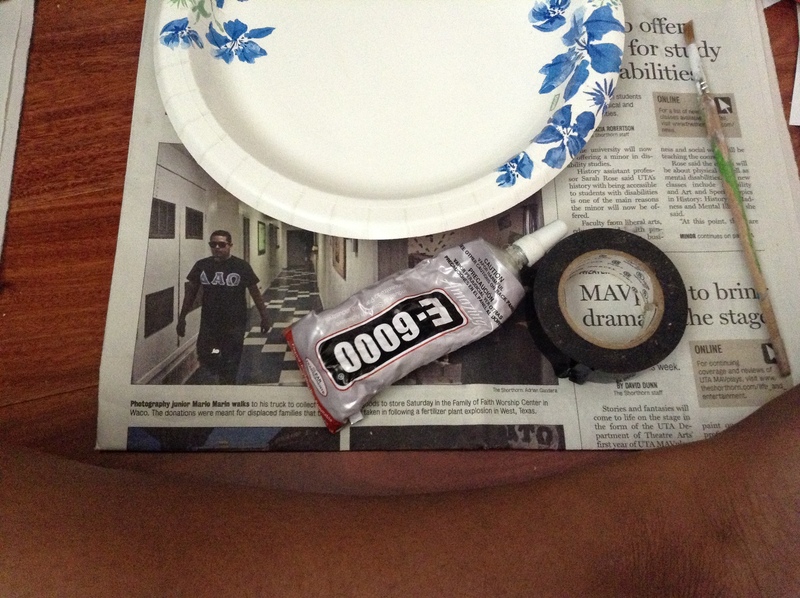 By the way….you need these four lovely items – E-6000 adhesive, a cheap paint brush you can toss after using it with the E-6000, black electrical tape, and a paper plate. Newspaper to work on top of is nice, too. Just saying. 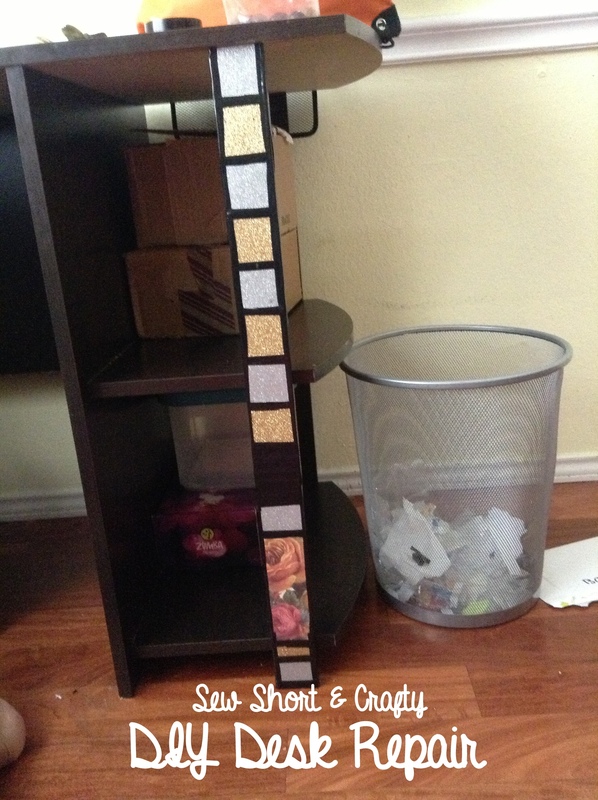 Apply the E-6000 to each square and attach it to the desk front. Fill in the scraps and scrapbook paper until the entire piece is covered. If it isn’t totally straight, that’s okay. I know my cuts were off and I have zero sense of straight lines, it seems. 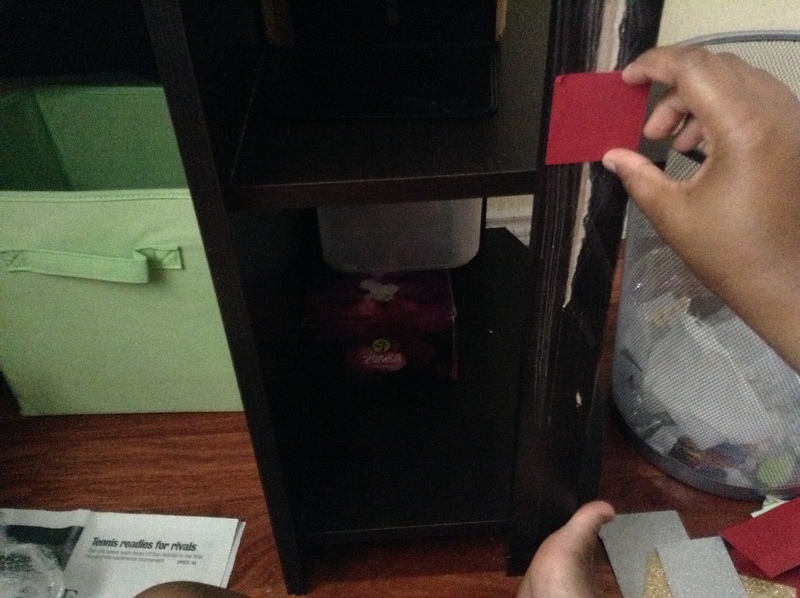 Apply the black electrical tape in between the pieces and around the edges to give the desk leg a slick, cohesive look. Unless the desk is brown, so the black looks weird. 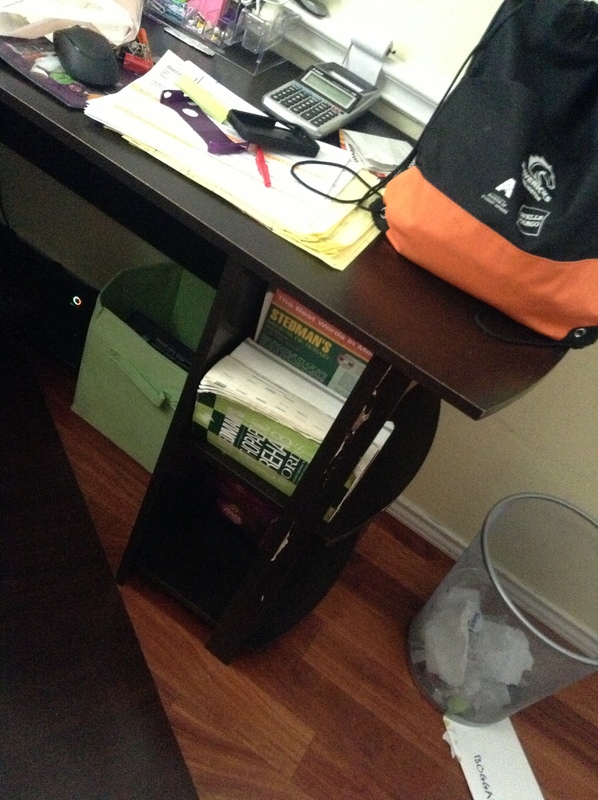 But then again, the way the desk faces in my room, it’s not obvious at all. 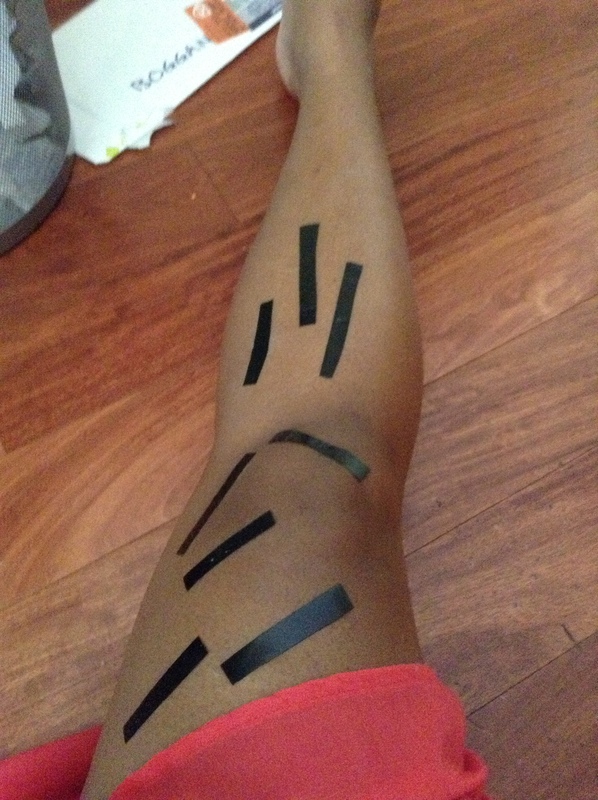 By the way, do you like my super high tech system for holding my tape after I cut the pieces I needed? And here is the finished desk leg! Tres chic, no? Just kidding. I’m not bilingual. No French, no Spanish, no Italian, nothing. I took three years of Spanish in high school and I remember very little. I know the common French words – bonjour, qui, and mon ami. That’s it. I think. Spanish – I can follow certain conversations, it depends on the subject. But I couldn’t tell you an exact translation. Umm…where was I? Oh! Thanks for reading, and come back soon!